If you want to get your hands on one of the best smartwatches that money can buy, then the Apple Watch Series 3 and the Samsung Galaxy Watch should be near the top of your shortlist. We're going to explain how they stack up against each other. We'll cover the design, specs and the other essential features of a smartwatch so you can decide which one suits you best (or just get an idea of which of these tech giants makes the best watch). As you'll actually have to wear these on your wrist, we'll start by looking at the aesthetics of these two devices. Apple and Samsung have taken completely opposite approaches to designing their smartwatches, while Apple has gone down the rectangular route, Samsung has chosen a more traditional rounded approach. Obviously, personal taste will come into which you prefer, but we will say the Apple Watch will be considered a design icon in years to come, just like the first iPhone, while the Galaxy Watch will largely be forgotten. The Apple Watch is sleek, stylish, and customisable, with a number of compatible bands from Apple, fashion brands such as Hermés and Coach, as well as bands from smaller companies. This ecosystem of compatible accessories is an area where Samsung has struggled in the past. The Apple Watch comes in two sizes, 38mm and 42mm. The Galaxy Watch will also come in two sizes, 42mm and 46mm. This means the Apple Watch is far more suited to smaller wrists, where as the Galaxy Watch may struggle in this area. The Apple Watch comes in a huge number of colourways and materials, firstly, you can choose between aluminium, steel, and ceramic versions. Then you can also choose between different coloured metals, such as silver, gold, rose gold and black. The Samsung Galaxy Watch comes in Steel, Rose Gold and Black models. There's something for everyone there. First let's look at the screens. The Apple Watch Series 3 features a second-generation OLED Retina display with Force Touch. It's max brightness is 1000 nits, and it's protected by Sapphire crystal on the stainless steel and ceramic models. The 38mm display has a resolution of 272 by 340 pixels, while the larger model has a resolution of 312 by 390 pixels. The 46mm Galaxy Watch features a 1.3-inch, Circular Super AMOLED (360 x 360) Always On Display covered with Corning® Gorilla® DX+ glass. And the 42mm version features a 1.2-inch display with the same spec and resolution as the larger one. We haven't seen them yet, but we can assume both will be brilliant displays. Time will tell whether they're better than the Apple Watch's. Internal specs for a smartwatch aren't as important as they are with smartphones, as the operating system and apps are much less power intensive. The Apple Watch Series 3 features a dual-core processor and 16GB storage. The Samsung Galaxy Watch features a Exynos 9110 Dual core 1.15GHz with 1.5GB RAM + 4GB Internal Memory. Although, the extra performance on paper often isn't noticeable in the real world. One of the most important specifications is battery life, and while the Apple Watch battery requires charging every night (or, at least every other night), the Samsung Galaxy Watch has a battery which can last "several days". The 46mm version features a 472mAh battery, while the 42mm model has a 270mAh battery. The Apple Watch's feature list is about as long as my arm, but the main focus is on fitness. The Apple Watch is able to track a number of workouts, including swimming, thanks to its 50-metre water resistance. It has a heart-rate monitor and GPS. There's even a model with cellular connectivity, meaning you can still receive and make calls while running without your phone. WatchOS 5, which comes out in Autumn, features 'Activity Competitions' allowing you to compete with your friends, new works outs (including yoga and hiking), and pace alerts. You can also download podcasts directly to the watch, and there's a new walkie-talkie mode, which allows you to have a conversation with other Apple Watch users. And finally, Siri is getting smarter. As we expected, the Samsung Galaxy Watch has a big focus on fitness, and is able to automatically track your cycling, swimming, squatting or sleeping. The watch will also track your wellness routine while out for a run, following your route using the built-in GPS, and sync everything seamlessly with Samsung Health. The watch will also keep track of your schedule, acting as a digital assistant, briefing you about all of your events and reminders for the day, before you have time to forget. Bixby features on the watch, and will be able to send messages, set reminders and begin alarms all using your voice. Because Samsung were keen to get Bixby on your wrist, that means the company has continued to use its own Tizen operating system, not Google's Wear OS, like originally rumoured. The Samsung Galaxy Watch starts at £279 for the Bluetooth-only model. We think that's a pretty reasonable price for a brand new smartwatch. We don't know how much the 4G model will be yet, as Samsung has stated that will be out later in the year. The Apple Watch is a bit more expensive, starting at £329, and ranging all the way up to £1,399 for the Edition model. 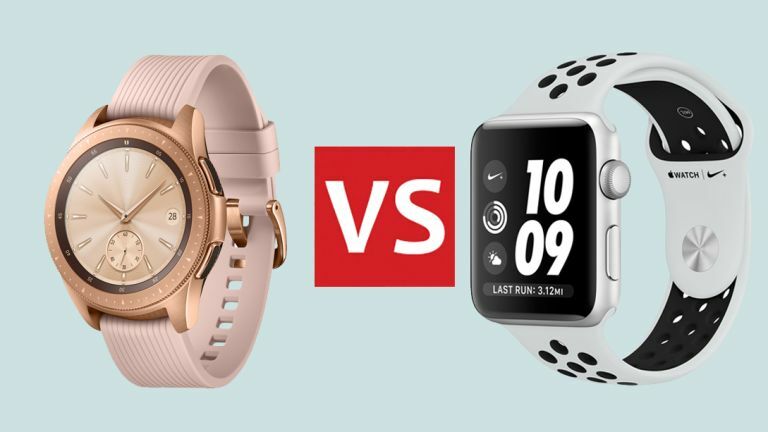 Obviously we can't draw a verdict yet, as we haven't seen the Samsung Galaxy Watch in the metal yet, but looks like the Apple Watch has finally has a true rival.